The trip was bound to be a good one; I was looking forward to writing about it afterwards. St. Patrick was an early Christian missionary to Hibernia and known as the Apostle of Ireland. His day, March 17, has become a holy day of obligation for the pious and a day of unrestrained drinking for the rest. It always falls within Lent, thus interrupting forty days of penance, penitence and repentance. I was wondering how the contradiction would be squared. My observations would be done in the north, on the fourth green field, as the Irish say nostalgically. Over the years, the Northern Irish have become used to squaring contradictions. Just a few decades ago bombs would go off on a weekly basis and people be killed regularly for reasons of seemingly disentanglable complexity. The situation has calmed considerably with the signing of the Good Friday agreement fifteen years ago. There are still Unionists and Republicans, English and Gaelic, the Falls Road and Shankill – which are, by the way, not ingredients to a Venn diagram of the conflict but various ways of looking at the same two sides – but they decided to take tiny steps towards each other and try to make things work. Things have worked for the most part. 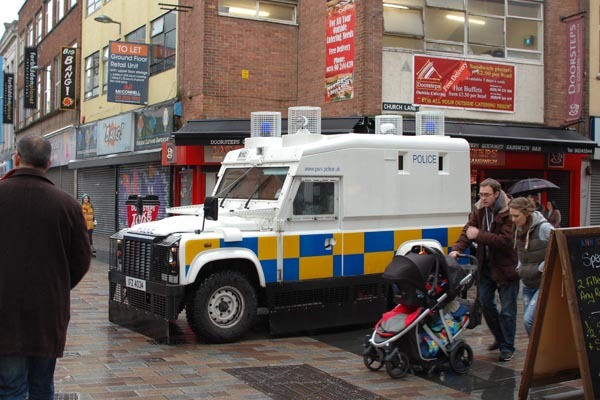 Outside the occasional riot, Northern Ireland isn't much different from the rest of the UK. Police stations still sometimes resemble set pieces from Total Recall, but the fortifications are coming down. Replacing the Royal Ulster Constabulary, which was considered biased, even sectarian, with the Police Service of Northern Ireland went a long way towards building trust in the communities, and more relaxed security has been a result. Another was the turning of Belfast from a city under siege to one of great economic promise in the early 2000s. Now it is under economic distress like any other medium-sized city in the UK. When I flew to Belfast for the St. Patrick's weekend, it was not only to quench my curiosity about how religious incongruities could be squared but also to see a friend of many years. Culturally, he has nothing to do with Northern Ireland or the conflict. Luck of the bad kind (denied entry to the country of his choice) and the good kind (an eager employer offering him an alternative to the job he couldn't do anymore) combined to bring him to the province more than five years ago. Now married, he has a small family and is unlikely to leave anytime soon, but he remains an outsider without passion or prejudice. The stories he can tell come from being an astute observer rather than a concerned party. It is with incredulity rather than injury that he speaks of Ormeau Road and how it changes from Protestant to Catholic as it crosses the Lagan. The roadblock by the bridge was a sniper's target as late as 1997. Further down the road is the Sean Graham betting shop where a gunman shot and killed five customers in 1981. There are fresh flowers below the small memorial on an outside wall of the shop. The dead are not forgotten. The casual visitor to Belfast notices nothing of the troubled past. Then a garish white-blue-and-orange police Land Rover slowly rolls into view, heavily armored and with wire mesh protecting its windows and emergency lighting. Among the doleful shoppers in a slightly dilapidated pedestrian area, it seems wildly out of place, but like cosmic background radiation, which testifies to the Big Bang fourteen billion years ago, it's a reminder of what used to be. It's also a warning of what might happen again because the conflict isn't over. While hostility has shrunk, the underlying divisions remain. Orange and green are not just colors in Belfast, but symbols of allegiance. There are Union flags flying from lampposts and curbs painted green, white and orange, demarcating territory. Catholic and Protestant is another division, less visible from the outside but more emotionally charged, impossible to argue with and beyond reasoning, like anything religious. And like anything religious, its minutiae are impossible to penetrate for infidels. There's God, there's Jesus, there's the holy book. What's the difference? And indeed, the differences in religious doctrine are completely irrelevant to most people's lives, but they act as important markers and proxies for the things that matter but which can't so easily be put into a word, an identity. Defining the divisions in Northern Ireland as religious has thus even less value than drawing the lines between Nationalists and Loyalists, Irish and British, James and Seamus, or Derry and Londonderry. Any of these pairs will suffice to start disagreement and conflict if the participants are so inclined even if they worship the same god on Sundays. History is of no use to understand the conflict. History serves to propagate it. "They came and took our land." "They oppressed our culture." "They killed our wives and children in cowardly acts of terrorism." Such injustices will always remain. Their resolution requires a subborn look forward and a willingness to clean the slate and start from scratch. This is not easy, and little things can upset the balance if they're perceived as big by the other side. For example, on 3 Dec 2012, Belfast City Council voted to restrict the flying of the United Kingdom's flag above City Hall to certain holidays. On the grounds that this constitutes a grave disrespect to their country, loyalists took offence. Protests, sometimes exploding into riots outside City Hall, have been simmering ever since. When I was there, all was quiet, though it seemed to me a particularly propitious day to protest. St. Patrick's Day is a celebration of Irishness and green and pride and, by extension, everything that's not British. In what seemed to me a blatant display of cultural insensitivity, the Union flag flew over City Hall. Youths shrouded in the same flag or wearing it printed on leggings as we saw that night are perceived as provocations. But St. Patrick's Day was chosen by the Council as one of the days to fly the flag. My friend lives in a terrace of British looking houses, narrow and tall and stacked side by side with no space going to waste. Who needs a yard when it rains all the time? There's parking in the front and the next terrace in the back. Inside it's cozy and cute and dominated by staircases. I slept high up in the attic. The first night, it rained all night, and it continued to rain through the weekend. It was also windy and miserably cold. Divis mountain was covered with snow, though spring was officially just around the corner. Every step outside was a challenge, and we didn't do much besides shuttling between St. George's Market and Caffè Nero, between restaurants for dinner and pubs for drinks. Many of the agents of the British Empire in Ireland were shipped in from Scotland, poor tenant farmers that were offered land and the chance to prosper by their own hard work. Without knowing what happened in the centuries since they first arrived, it's hard to understand that there should be such hostilities between the two groups. Both originally speak Gaelic languages, after all, and the ways they speak English, their accents for lack of a better word, though they might object to that, are quite similar to the uneducated ear. Irish English is often described as lilting, an attribute that has no meaning to me. On Saturday, we went to St. George's market, a splendid hall in red brick, wrought iron and irregular glass, that used to be the city's primary food market. It has traded its stark utility for epicurean delights and the leisures of the weekend. Instead of a slaughterhouse, muddy vegetables and cheap fish, there are now artisanal baked goods, exhibitions by local artists, and food from the around world cooked fresh at a dozen stalls. In the middle of the market was a small stage. We took seats right in front of it, digging into coffee, bespoke omelets and Italian cakes from the booths around us. Listening to the traditional Irish band on the stage, I managed to get deeper into what Irish English is. The leader of the band was an old man on wiry legs, a gnarly leprechaun of musical genius with a bushy beard and a talent to play whichever instrument was handy. He started talking about the big drum sitting to the side of the stage. It's very loud, he warned the audience. Normally, it would be played "from the hells". The hells, I wondered? How many are there? But he wasn't a promiscuous Satanist. He spoke in the way of the Irish and pronounced the [i] like [e]. Between pieces, he repeatedly and warmly welcomed "vesetors to Northern Ireland" where things are "a wee bit deffrent". Later I realized that this vowel shift continues in [e] going to [ey], as in Shale for Shell. This linguistic excursion is of course a gross simplification and an ignorant generalization. Any Irishman will tell you that there is no such thing as an Irish accent, and that he can tell with certainty anyone's provenance to the province if not the town from the way he speaks. But for me, this was good enough. I can now describe what an Irish accent is like and don't have to resort to words with no meaning to me or to poor, mocking impersonations. I leaned back, enjoyed the music and the cake and reminisced about London where there are plenty of markets like St. George's. Some are even nicer and many are bigger, but none has remained an authentic hub of the community. Most markets have been listed in guidebook top tens. Invariably, the enjoyment is spoiled by the hordes of tourists that push throw narrow aisles and gape incredulously at the things that are there every weekend, unchanged but now also almost unenjoyable by locals. From the market we went to the pub. My friend told me that many took sides in the conflict, providing refuge, sustenance and support, and keeping away the others. The details were not advertised but known to neighbors. I can't see it as a good idea to enter such a pub as a stranger. My friend also told me about The Rose and Crown on Lower Ormeau Road where the proprietor, a soft-spoken but hefty Irishman of strong principles, once head-butted an IRA member who tried to bully his way to a drink after last orders out onto the sidewalk. It could have easily ended in blood, but a few days later two higher IRA charges came to apologize for "unacceptable behavior". On Monday, with rain still coming down relentlessly, we went to the Titanic Museum. The big boat was built in the shipyards of Harland and Wolff, on the right side of the river Lagan, just across from central Belfast, but what should be a major tourist draw was for the longest time ignored with considerable embarrassment. That the boat only sailed for five days might have had something to do with it. That it took 1500 lives when it sank might have contributed as well. But in 2012, a hundred years after the disaster, a shiny new museum was dedicated to the construction of Titanic and the historical context of industrial Belfast, the world's dominant supplier of linen before shipbuilding became big. The museum is spectacularly designed and pulls out all the stops, trying hard to justify the eye-watering admission charges, but it falls short when the actual sinking is concerned. Whose fault was it, I want to know. Was the recklessness of the captain, so eager for the fastest crossing of the Atlantic that he ignored warnings of icebergs, to blame? Was it the operator's delusion of the ship's invulnerability? Was the shipmaker negligent in implementing safety features? Who decided on the number of lifeboats and vests, and who was responsible for evacuation procedures? After three hours immersed in history coming alive, these questions remained unanswered. Also unanswered remained my questions about boozing to the hilt during Lent. Due to the demands of the wee one, we missed the parade. Later that day, my friend and I checked out various pubs downtown and near the university and had a pint here and there, but where was the party? The mood around us wasn't subdued but it wasn't exactly exulted either. People were drinking as they would be on any other Sunday, meeting friends, chatting and hanging out in front of pubs even though it was raining. There were silly hats and little plastic shamrock flags but no dancing on tables, no brawls and no puking in the streets. No one appeared drunk. I was left a bit disappointed. What would I write about?